A Day in the Life of a Coalminer , produced by the Kineto company in 1910, is a difficult film to define in terms of genre. Conceived primarily as an 'instructional' film, it documents the various industrial processes involved in coal production. 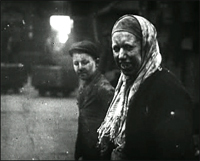 However, by placing these in the context of a single day in the life the eponymous 'coalminer', who is seen leaving and returning to his family at the beginning and end of the film, A Day in the Life of a Coalminer can also be seen as a forerunner to what would later be termed 'documentary' - what Grierson would call 'the creative treatment of actuality'.